What the defense did was mask an awful showing by the Colorado offense. The Buffs had only 125 yards of total offense on the day, and only seven first downs. Joel Klatt produced only 78 yards through the air, and the Colorado rushing attack was held to a net of 47 yards. Conversely, Washington State had 402 yards of total offense. How then, did the Buffs manage to emerge 2-0 on the season? The game was tied, 3-3, at halftime, thanks to Mason Crosby’s second 50+ yard field goal in as many weeks. In the third quarter, Colorado free safety Tyrone Henderson blocked his second punt of the day. The first blocked punt managed to get past the line of scrimmage, but this punt rolled back into the Cougar end zone, where it was recovered by Colorado V-Back Lawrence Vickers and a 10-3 Colorado lead. After a WSU field goal late in the third quarter cut the Buff lead to 10-6, red-shirt freshman linebacker Joe Sanders, substituting for injured starter Brian Iwuh, intercepted an Alex Brink pass and raced 51 yards for a 17-6 Colorado advantage with 9:13 remaining. Just had been the case against CSU, however, the Buffs could not stand the prosperity of a double-digit lead. After holding the Cougars out of the end zone for three quarters, the Buffs’ defense surrendered a score in just over a minute, as Brink hit wide receiver James Hill for a 60-yard touchdown. The lead remained at five points, 17-12, a few moments later, when the Cougars’ two-point conversion attempt failed. With momentum on the side of the home team, the Buffs needed a lift. They got one from Terrence Wheatley, who returned the ensuing kickoff 59 yards, setting up a 41-yard field goal by Mason Crosby, giving the Buffs a 20-12 lead. Washington State then drove 54 yards in eight plays before McChesney’s fumble recovery saved the day. In the Big 12 North, being “good as a team” was taking on new meaning. While the Buffs were defeating Washington State, other contenders in the North Division were showing their vulnerabilities that same weekend. Kansas State, ranked 13th in the nation, was dismantled at home, 45-21, by Fresno State. Missouri, in at #19, lost on the road, 24-14, to Troy State. Nebraska, playing its first game against a Division 1-A team under new head coach Bill Callahan, lost to Southern Mississippi at home, 21-17. With Iowa State falling to Iowa, 17-10, only Colorado and Kansas were left undefeated in the North Division (and Kansas had only played – and beaten – football powerhouses Tulsa and Toledo). “They don’t put UW in the press guide,” concluded Barnett. “They just put W”. The 2-0 Buffs now returned home to face North Texas. The Mean Green was 0-2, having been dominated by Texas, 65-0, and surprised by Florida Atlantic, 20-13. On paper, the game looked like an easy path to the Buffs’ first 3-0 start since 1998. But the 2004 Buffs were not familiar with easy paths. Against the Rams, Colorado had taken a ten point lead midway through the fourth quarter after an interception return for a touchdown. Against the Cougars, Colorado took an eleven point lead midway through the fourth quarter after an interception return for a touchdown. CSU struck quickly thereafter, scoring to cut the lead to three. WSU struck quickly thereafter, scoring to cut the lead to five (after a failed two-point conversion attempt). The Rams were afforded the opportunity for a last minute drive to win the game or send the game into overtime. The Cougars were afforded the opportunity for a last minute drive to send the game into overtime (after a Colorado field goal had boosted the lead to eight). CSU connected on a third-and-long pass to put the ball on the Colorado one yard line with less than a minute to play. WSU connected on a third-and-long pass to put the ball on the Colorado five with less than a minute to play. The Rams, arguably using poor clock management, failed on a frantic last second run, sealing the Buffs’ win. The Cougars, arguably using poor clock management, terminated their chance for victory with a fumble at the Buffs’ two-yard line. Five yards away from an 0-2 start, the Buffs were 2-0. It was all too familiar. It seemed as if fate had a sense of humor. As the last minute drama unfolded, I wasn’t all that dismayed or depressed. After all, we had no business winning this game. Washington State had outplayed Colorado, at least statistically, throughout the game. After one minute of play in the first quarter, the Wildcats had over 60 yards of total offense. The Buffs didn’t reach that total until the second half. Colorado would punt ten times on the day, not surpassing the 100-yard mark in total offense until late in the fourth quarter. If Washington State had not played well enough to win, it at least had an offense that had generated over 400 total yards. Yet here were the Buffs, leading – again. A week earlier, a loss to the Rams would have been devastating. An opening loss – after an off-season which could only be described as tumultuous, after taking a 17-0 lead against the Rams (only to see the Rams forge a 17-17 tie), and after taking a 27-17 lead with just over nine minutes remaining – such a loss may have done irreparable damage. To the team. To the team’s image. The Buffs’ numerous critics would have had a field day. Such a feeling of dread did not come over me during the last seconds of the WSU game. Sitting in the end zone of Qwest Stadium, the home of the Seattle Seahawks, amongst 5,000 or so fellow Colorado faithful, I knew I would be disappointed with a last minute loss to Washington State; perhaps even devastated. But in my heart of hearts, I knew we didn’t deserve the win. I also knew that such a loss would not be as cataclysmic as a similar loss to the Rams would have been. This is not to say that I didn’t have a rooting interest in the outcome. When WSU quarterback Alex Brink was flushed from the pocket, and tried to make it to the end zone on his own, I was yelling as loud as anyone. When the Buffs stopped Brink at the two, I was counting down the seconds, in unison with the gold-clad fans in the southeast corner of the stadium. Was it the CSU game all over again? Would the clock run out before the Cougars could get off another play? The referee had blown the clock dead at five seconds. Watching the teams unpile near the endzone, my first thought was that the officials had stopped the clock because the Colorado players were too slow in getting up. My fear was that the Cougars would be given one more chance to score. Then I looked down at the field, and saw an official kneeling at the two yard line, pulling players away from the pile. Just as it began to register why an official would be in such a position (looking for the ball! ), the signal came up. The official signaled toward the far end zone! Fumble!! Colorado ball!! Game over!!!! Okay, it took a kneel down to officially end the game, but the fumble started the celebration. With the official’s signal, I let out a yell. Not a “Yesssssss! !” type of a yell, nor a “Yeaaaaaaa! !” type of yell. Just a yell. Loud and long as I could make it, with my arms outstretched like a referee signaling a touchdown. I remember my reaction to the win, largely because that was the same way I reacted after the final seconds had ticked off the clock a week earlier in Boulder. Oddly, I didn’t share these moments of celebration with anyone. I didn’t high-five my fellow fanatics; I didn’t hug anyone. There was just the yell. I think it was because I had taken the past eight months so personally. It was tough to be a Colorado fan in 2004. Everyone was down on the program, if not openly hostile towards it. My normal zeal for preseason magazines was non-existent. I knew what they would say: “Colorado in turmoil”; “lack of talent”; “4th place at best in the six team Big 12 North”. I didn’t care to read the Buffs’ obituaries over and over again. The two opening last minute wins had been a welcome distraction to the off-season. It was true that Colorado was a mediocre team. It was also true that Colorado had beaten two teams who were also mediocre. But against CSU and WSU, in those last frantic seconds that set off huge celebrations, once with 50,000 in unison, next with 5,000, I was given a great gift by the Colorado players. I got to yell out loud for my team. – There was an 80% chance of rain for the Washington State game (this was, after all, Seattle), but the game saw nary a drop. – Sophomore free safety Tyrone Henderson blocked two kicks on the afternoon, setting a school record. 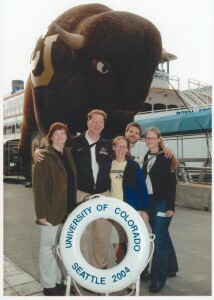 The second kick, recovered for a touchdown, was the first blocked kick returned for a score for the Buffs since 2000 (when John Minardi recovered a block kick against Missouri as part of a 28-18 CU win – 11/4/00). – Joe Sanders returned his first interception as a Buff for a touchdown, becoming the 11th Buff to do so since 1992 (Brian Iwuh had become the 10th the week before against Colorado State). – The win gave the Buffs a 2-0 record against Washington State in games played in that state. Ironically, in neither game did Colorado score an offensive touchdown. In 1982, the Buffs gave Bill McCartney his first win as head coach, defeating the Cougars, 12-0 on four field goals, in a game played in Spokane. This post, about the Washington State game, from the 2004 Season, is filed under Game.